Edwin Bruce signed with Sun in 1957 when he was 17-year-old newspaper delivery boy for the Memphis Press-Scimitar. You might expect that story-line to result in some teen fluff about a high school hop or being jilted at the senior prom. Not here. At least not at Sun and not in 1957. Bruce's first two records were dark. From the sound of them, you'd never know he was a kid delivering newspapers. Here included his second record, "Sweet Woman" was enough to rekindle the faith of Sun fans in early 1958. From the first 4 bars, it was clear we were in the presence of greatness. Everything works here. This is an edgy, tense record with not the slightest concession to pop sensibilities. Its hard to imagine two guitars, a bass and drums put to better use. In fact, the guitar work features a duet between Edwin Bruce and Billy Riley. Riley provides a solid boogie figure under the vocal and joins forces with Bruce during the 12-bar solo. Bruce's vocal is a standout. The same bass notes had introduced Jimmy Bowen's hit record ''I'm Stickin' With You'' just a year earlier and that memorable guitar figure also turns up on Elvis's ''One Night'' in 1958. In a 1989 interview with Barbara Pittman, all was revealed. "Stan Kesler had in mind that he wanted to put together a vocal group, an Anita Kerr type of thing. He got us all into the studio. It was horrible. The voices just clashed. It was real difficult. The arrangement was all Stan's. Elsie Sappington sang that little solo on there. I was just a kid and my voice hadn't developed enough for me to hit those high notes. I sang lead all the way through until that part of the song". 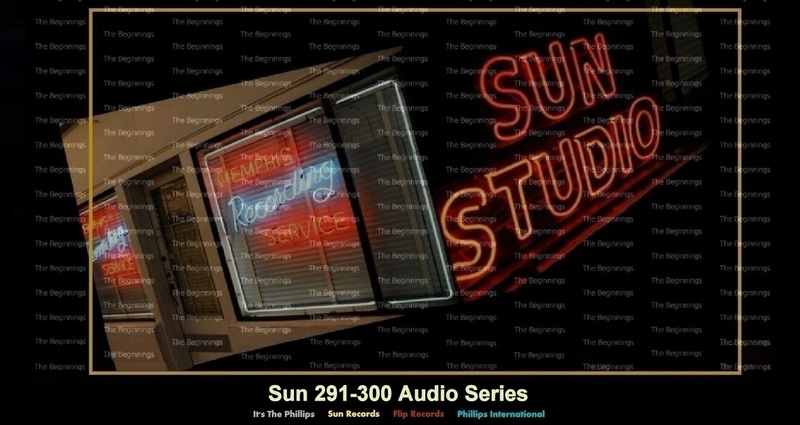 The Sunrays consisted of Barbara, along with Elsie Sappington, Hank Byers and Jimmy Knight. Another outing in the not-very-typical Sun record sweepstakes. As on his previous outing (SUN 280) and on the obscure Tampa record that preceded it, Lee demonstrates his penchant for harmony singing. Lee had been parachuted onto Sun by dee-jay Dewey Phillips who had virtually demanded that Sam Phillips sign him. Lee cheerfully admits that he didn't belong there. The A-side of Gene's only Sun release was "Drinkin' Wine". This, too, is an interesting story. The song began life as "Drinkin' Scotch" but within several takes Scotch had morphed into Wine. Gene jokingly suggested that Sam's taste in beverages might have had something to do with it. Carl suggests, "Wine was a gentler image and they may have been concerned about radio play in those days". That may be closer to the truth, but the sentiment seems laughable now. Even when you remove the scotch in favor of a chilled class of Chardonnay, you're still stuck with a guy drinking bourbon while he's "sipping along slow on my bottle of brew". Now to mention the threat of violence against his two-timing woman. All in all, it's a delicious slice of southern lowlife that wasn't going to become a mainstream hit even if the scotch had been phased out. After changing Scotch to Wine, Phillips was still not happy with the result and brought in drummer Jimmy Van Eaton. The change in sound is telling, especially when Van Eaton decided or was told to play through the stops. As originally conceived by Gene, this was a stop-rhythm talking blues. It sure didn't end up that way. Surprisingly, at the end of "Drinkin' Wine", a piano can be suddenly heard in the mix. Has it been there along? Aural evidence suggests not, but when the dust clears during those final drumbeats, there is the unmistakable sound of a piano. Session logs are imprecise but Carl Simmons remembers recording several sessions with Charlie Rich present on piano. However, Rich had not yet joined the scene in January 1957, when this session is suggested to have occurred. In any case, "Drinkin' Wine" is a hell of a special record. A very southern 12-bar talking blues about a guy who's been done wrong by his woman and is getting drunker by the minute and thinking about killing her. On the other hand, it's a showcase for some fine, fine musicianship and unbridled energy in an era when such expression was quickly becoming verboten. The record should have hit the streets in January 1957, when it was recorded, not in April 1958 when it finally did. The reasons for the delay are unimportant. What matters is that what little chance for success it might have had were now all but gone. There weren't a lot of talking blues records issued by Sun, and certainly not by a white man in 1958. What might have been some down-home backporch music was turned by Gene Simmons and his band into something quite unusual. Carl Simmons was a fine picker and his guitar work is highlighted on the disc. However, it's the drumming, most likely by session man Jimmy Van Eaton, that lands the record here. ''After all this time I'm about 70% sure that's me playing on there. I know that's not my usual style but I was pretty adaptable and that song required something different''. Jimmy Van Eaton works the hi-hat and snare during the verses and, following some deft two-bar drum rolls, switches to backbeat for the chorus and guitar solos. It's not clear how else Jimmy (or any drummer) could have approached ''Drinkin' Wine''. Something had to distinguish the recitation from the chorus, and whatever playing you did under the spoken verses had to be tasty yet unobtrusive. An enduring mystery surrounds the odd fade-out after the seemingly final bass drum and cymbal crash. During the fade we hear a series of drumbeats and repeated piano notes that lead nowhere. We assumed that this may have been either a rehearsal or an outtake that nobody expected to use. But there's another possibility, suggested by Van Eaton, himself, during a recent listening session. ''That sounds like a bit of reverb that just went on too long; like the drum and piano just got caught up in that slap-back echo'' It's an intriguing idea even if it suggests some sloppy editing when it came time to master the original tape. Between late 1955 and early 1957 Gene Simmons and his brother Carl (lead guitar) and bass player Jesse carter were frequent visitors at 706 Union Avenue. They arrived, they spent the day in the studio laying down tracks, and they drove back down to Tupelo. Over and over, and they had nothing to show for it. When Gene finally decided to try his luck at Hi Records and enjoyed some success in 1958, it was time for Sam to go through the mountain of tape boxes with Gene Simmon's name written on them. At a Hi Records party, well lubricated as ever, Sam announced that Gene was ''the most patient man I've ever worked with'' and released ''I Done Told You'' backed with ''Drinkin' Wine''. The guitar playing on this side is highly unusual, to say the least. For one thing, the whole record is like a time warp. If it had been released in a timely manner (not nearly two years later) it would have appeared around the time of ''Dixie Fried'' and ''We Wanna Boogie''. So sitting there among the slightly more polished early 300 Sun number series, it sounds a bit raw. And this comes at a time when the pop music industry was starting to slick itself up and leave any hint of redneck menace behind. The lyric here, with references to a hard drinking jilted lover carrying a gun were commercial suicide. But Sam saw it as the best of what he had in the can and, besides, he liked how it sounded. On "Sweetie Pie", drummer Van Eaton lays down a really fine track, emphasizing the cowbell. The band trades two bar phrases with Blake, working a slowed down Bo Diddley rhythm. This effort, which included the cream of Sun's studio musicians. Everyone is here, from Roland Janes to Stan Kesler to Jimmy Van Eaton. Yet the results still seem a bit forced. Its hard to blame the band for what goes wrong here. So why aren't the results more engaging? It comes down to Blake's performance. Unlike the best of Sun's rockabilly, Blake sounds like he's posturing here; almost like an old man trying to sing young folks' music. "I Dig You Baby" featured on Tommy Blake's second and last single for Sun. Neither enjoyed much commercial success. In fact, a harsh verdict might be that both are deservedly rare. Blake's efforts have been minimized even by most collectors who lionize every minute of music that ever appeared on a yellow Sun label, or every note ever played in the tiny studio on the corner of Union and Marshall Avenues in Memphis.